The DMV has a 5 month backlog of car titles to sort through. 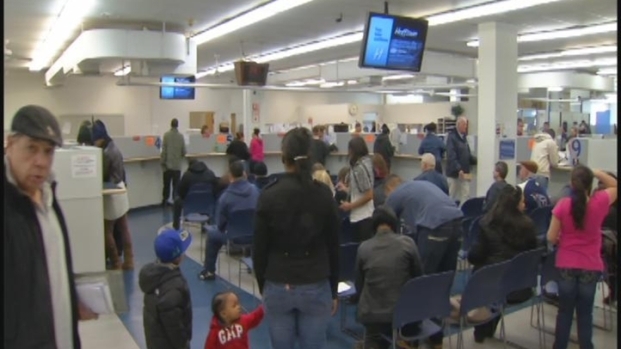 We all expect to wait when we head to the Department of Motor Vehicles, but one group of residents is waiting at least 5 months for a crucial piece of paper. "It almost feels like you're being held hostage. There's nothing you can do. You just have to wait for the state of Connecticut to get around to processing your title. They can't even give you a guesstimate on how long you'll wait!" said Cheryl Bragoni, of East Granby. Employees handling your car titles are stuck in a paper pileup. Bragoni applied for a title last November and is still waiting. "It's not fair. We need the title to our car. We can't sell it. We can't trade it in. We can't do anything without the title to our car," said Bragoni. We all expect to wait at the DMV, but some people are waiting for 5 months! It seems that there's a backlog at the Title Department. Monica Buchanan went straight to the new Commissioner and got some answers about the dysfunction at the DMV. It's not only a hardship for Bragoni, but for dealerships across the state. After all, without titles, you can't sell cars. "We have at least 20 cars sitting around the back of our building, covered in snow that we can't sell because we are still waiting on the titles," said John Mocadlo of Barbarino Nissan, "they are doing the best they can at DMV, but we're are losing money in the process." DMV Commissioner Melody Currey understands dealers concerns. She says the backlog is the result of cutbacks. Right now, there are only 5 fulltime employees processing titles for the entire state of Connecticut. "The department had a 53% cut in staff and just an 18% cut in workload. If you do the math, you're going to get behind. How it got to the point of not being addressed before now, I wasn't here, I couldn't tell you," said Currey. Currey was recently appointed commissioner by Gov. Dannel Malloy last month. In 2008, the titling department processed more than 642,000 titles. In 2009, that number dropped to 559,000. Then last year, plummeted to just 485,000 titles. "The backlog is unacceptable. Totally unacceptable. It's not what we are about. it's not being customer friendly," said Currey. The Commissioner is assuring residents it won't be like this for much longer though. In just 2 months, she expects processing time to go from 5 months to just 30 days. "We are going to do that with temporary help. We're doing it with overtime and we're doing it be sending out the scanning of all the documents to a private company to catch us up," said Currey. Currey is doing it in a time when Governor Malloy is dealing with a $3.5 billion dollars deficit. Even so, the DMV apparently has the green light to hire employees and spend money. "It's coming out of the contingency fund, but this is a priority. This is a top priority. We can't have that type of backlog at motor vehicles," said Currey. She says the long-term goal is for an e-title system where everything goes online and the lines move right along. "If you have to come to the DMV, its going to be a pleasant trip because it's going to be a quick one," Currey said.